Camo Buckles There are 6 products. Curved Urban Camo Side-Release Whistle Buckle. Perfect for making survival bracelets!Length: 2"Width: 1"Height: 1/2"
Flat Urban Camo (Broad Pattern) Side-Release Whistle Buckle. Perfect for making survival bracelets!Length: 2"Width: 1"Height: 3/8"
Curved Urban Camo (Narrow Pattern) Side-Release Whistle Buckle. Perfect for making survival bracelets!Length: 2"Width: 1"Height: 1/2"
Flat Forest Camo Side-Release Whistle Buckle. 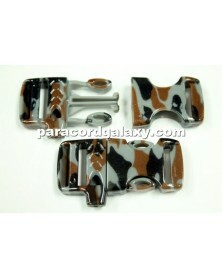 Perfect for making survival bracelets!Length: 2"Width: 1"Height: 3/8"
Curved Forest Camo Side-Release Whistle Buckle. Perfect for making survival bracelets!Length: 2"Width: 1"Height: 1/2"